Las Gaviotas, a charming Ocean Front Community located in Rosarito Beach Mexico welcomed 6 new homes owners to their community in the last 7 months with 2 sales pending. This is a strong indicator that home buyers and Investors are feeling secure once again about buying properties in Mexico’s beach resorts. Calafia Condos who has started delivery of their 3rd tower along with a brand new ocean front infinity pool, new 5000 square foot club house and a large array of amenities such as a 16 seat private movie theater, spas, and private Jacuzzis is also seeing the upswing. While the Developer of Calafia is busy welcoming homes owners that bought over 2 years ago, he is also very optimistic with how well sales are going with new buyers. Just this week, Bill Brotherton and Kristy Hugstad from Dana Point California, purchased a Calafia Condo in Tower III after looking for over a year. The reason, says Bill Brotherton was location, price and amenities, not to mention the $300.00 a year property taxes they will pay for their ocean front Condo. That’s what a dinner would cost in most mayor ocean front communities in the US. For both Club Marena and Palacio Del Mar, the penthouse units still seem to be the number one choice. Palacio Del Mar just closed on a luxurious 2800 ft², 3 bedroom, 3 bath penthouse .This luxurious community that offers home owners granite bottom indoor lap pool, ocean front infinity pool, a 25,000 square foot club house complete with spas, state-of-the art gym, all overlooking Descanso Bay. The best Amenity yet, a private 14 seat shuttle bus. Larry French , a Realtor with The Baja Real Estate Group, just put under contact a 3500 ft² penthouse in Club Marena . Larry who in recent months has sold 3 villas in club Marena, says not only is he seeing great buyers he is also seeing activity from local Agents and their buyers touring his listings. Another good sign for Baja! A welcome sign for the Baja Real Estate market is the new construction of Naos Living , the areas first green building projects with a focus on wellness and lifestyle. “I am pleasantly surprise with how well we are doing” says Catherine Krupshaw a US Broker from California, who is now leading the sales at Naos, she boasts – “the project speaks for itself. Who wouldn’t want to own an ocean front condo on a long sandy beach with prices starting at $300,000?” – Krupshaw asks. “The latest buyer at NAOS, who chose to buy a one bedroom with a Den is looking forward to the rental opportunity”, Krupshaw adds – “with the Convention Center being built just a mile away and due to be completed around the same time as Naos in mid-2012”. Now is a unique moment in time where property prices have been rolled back to levels not seen in years. Don’t miss the opportunity to come see for your self. Browse for Homes for sale in Las Gaviotas. 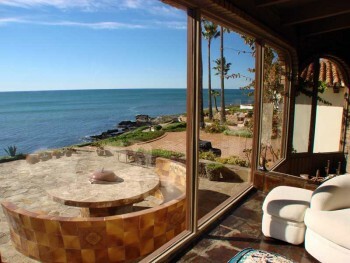 Click here for more Rosarito Beach Real Estate.